In small animal medicine, mass lesions are routinely identified on palpation and ultrasonography. These masses can arise from 2 general processes in dog and cats: inflammation or cellular proliferation. Differentiating these processes is an important first step in cytologic evaluation of fine-needle aspirates or impression smears. Q • What types of inflammation cause cutaneous masses or lesions? A • Suppurative and pyogranulomatous inflammation are common causes of cutaneousmasses or open draining lesions. In aspirates where the primary process is suppurative inflammation, neutrophils are the most common cell type; they can be degenerative or nondegenerative. It is important to closely examine the nucleus of these cells for evidence of karyolysis—typified by a pale and swollen nucleus that has begun to lose its filamentous segments—because this is a hallmark feature of degenerative neutrophils. The presence of degenerative neutrophils is commonly associated with bacterial infection. Pyogranulomas consist of a mixed inflammatory population, including neutrophils, macrophages, multinucleated giant cells, and lesser numbers of lymphocytes and plasma cells. Infections with higher-order bacteria or fungi such as Blastomyces dermatitidis are a common cause of this type of inflammation (Figure 1, above). Q • What types of nonneoplastic masses are found in dogs and cats? A • Common nonneoplastic masses include sebaceous hyperplasia/adenoma and follicular cysts. Follicular cysts consist of thick aggregates of keratinaceous debris and mature, keratinized, anucleated squamous epithelial cells (Figure 2). Negative-staining imprints of cholesterol crystals can also be observed. Sebaceous masses are cytologically distinct. They are of low cellularity, with rare sebaceous epithelial cells identified. Sebaceous hyperplasia and adenomas cannot be distinguished from each other by using cytologic examination alone; however, sebaceous adenomas are more likely to form a discrete mass. On gross inspection these “wart-like” masses are often pedunculated and multilobulated, and they frequently develop on the head or dorsal trunk. Cytologically, the sample is highly cellular and consists of multiple clusters of sebaceous epithelial cells. These cells have discrete clear cytoplasmic vacuoles filled with nonstaining lipid material (Figure 3) and a small, round nucleus with a condensed chromatin pattern. Q • What types of neoplastic masses are found in dogs and cats? A • Although neoplasms of the skin and subcutaneous tissue are numerous, common tumors include mast cell tumors, histiocytoma, lipomas, and squamous cell carcinoma. Mast cell tumors are more common in dogs than cats. They are round cell tumors that are fairly easy to diagnose on cytologic examination. Aspirates of mast cell tumors often contain many individualized round cells containing a moderate amount of cytoplasm that is often filled with many metachromatic granules (Figure 4). The granules stain very well with Wright’s–Giemsa but unpredictably with Diff-Quik–type stains. 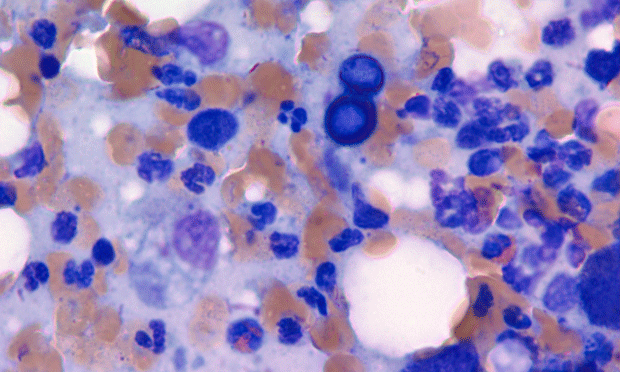 Eosinophils often accompany mast cell tumors in dogs but do so less commonly in cats. Histopathologic assessment is necessary for grading these tumors. Histiocytomas are tumors unique to dogs. They are round cell tumors and occur in dogs of any age; however, in young dogs they usually resolve on their own. Cytologically, the sample is highly cellular and consists of sheets of round cells. These cells have a moderate rim of basophilic cytoplasm, often with a clearing of the cytoplasm at the periphery of the cell (Figure 5). The nuclei are round and sometimes cleaved, with a smooth chromatin pattern; prominent nucleoli are occasionally observed. As the tumor begins to resolve, increasing numbers of small lymphocytes can be seen, sometimes outnumbering the neoplastic cells. Lipomas are very common in dogs and often have low cellularity. Large droplets of lipid are observed on the unstained slide and often wash off during the staining process. Adipocytes are large cells with voluminous, pale-staining cytoplasm packed with lipid and a small round nucleus (Figure 6). It is common to also see small mesenchymal cells associated with the mature adipocytes. These small, spindle-shaped cells with small, oval nuclei are probably part of the connective tissue stroma that holds the adipocytes together. Lipomas are often cytologically indistinguishable from mature adipose tissue, and many cytologists will interpret them as mature adipose tissue in their reports. However, if a discrete mass was aspirated and the clinician feels the aspirate was a representative sample, the mature adipose tissue can be interpreted as a lipoma. Squamous cell carcinomas are very common tumors and the most common tumor of the head and neck of cats. Samples often contain a mixture of cell types because the neoplastic squamous cells are frequently accompanied by inflammatory cells (primarily neutrophils). Depending on the amount of inflammation, diagnosis can be challenging because squamous cells may become large and atypical as a result of the inflammatory process. The large epithelial cells are typically arranged in clusters or sheets. These cells may have a waxy, pale blue keratinized cytoplasm and a round nucleus with prominent nucleoli. Occasionally, cells may contain perinuclear vacuoles (Figure 7). Neutrophils are often observed coating the cytoplasm. Cytologic examination of mass lesions is a noninvasive, inexpensive, and often diagnostic technique that provides a useful addition to clinical practice. Many specific diagnoses can be made with cytologic examination that will help the clinician choose the proper treatment. Often, identification of the underlying process (eg, inflammation, cyst, or neoplasia) is an excellent first step in obtaining an accurate diagnosis. Evaluation of sensitivity and specificity of cytologicexamination: 269 cases (1999-2000). Cohen M, Bohling MW, Wright JC, et al. JAVMA 222:964-967, 2003. Sample collection and preparation in cytology: Increasing diagnostic yield. Meinkoth JH, Cowell RL. Vet Clin North Am Small Anim Pract 32:1187-1207, 2002.